FREEMASONS are celebrating the 300th anniversary of Grand Lodge by engaging with their local community. Seven Gloucestershire lodges meet at the masonic hall in Park Road, Stapleton, and members ventured a stone’s throw away to Elm Tree Farm to offer up some practical help as well as put on an afternoon of fun and entertainment. The event brought in £1,000 for the farm, which is run by the Brandon Trust to provide support and training to adults with learning disabilities and autism. The money will go towards a multi activity centre on the 47-acre site. The Provincial Grand Master of Gloucestershire, Tim Henderson-Ross and his Assistant, Nigel Bridges, were among the many visiting masons. Other lodges are making donations too and it is hoped the total will be above £4,000. 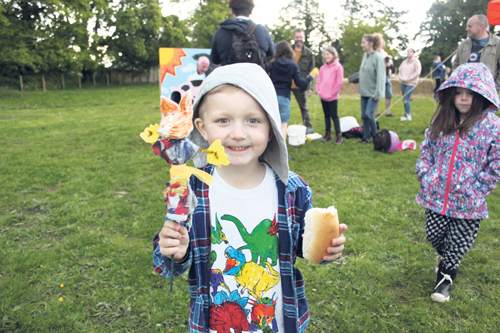 Organiser Steve Manning, of Lodge of St Christopher, said the day, which included a barbecue and bar and a performance by the folk band Sons of Derek, had been a great success in spite of two torrential thunderstorms. The masonic hall is having an Open Day on Saturday July 1, when the public can go along to the hall at 140 Park Road and perhaps get to know their neighbours better. The farm also has a very popular Open Day - Sunday June 11.